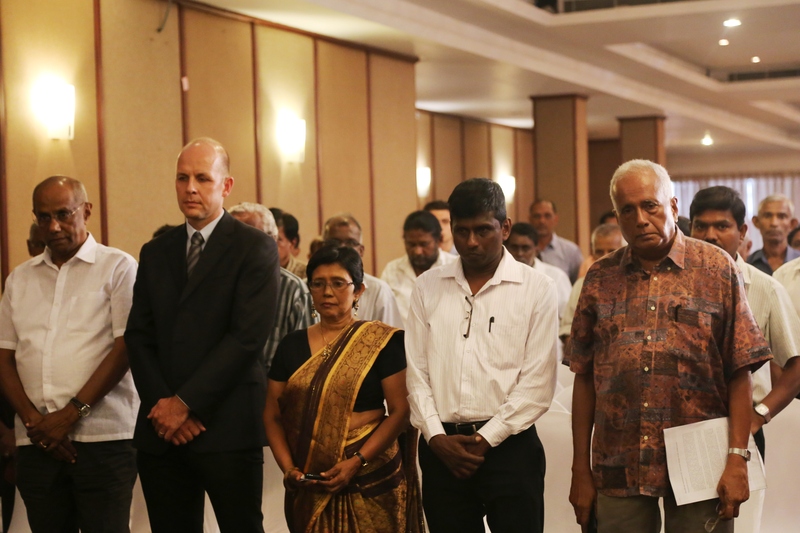 Free Media Movement marked World Press Freedom Day yesterday (5th) in Colombo. The gathering was held with 150 participants at Hotel Janaki. Media workers, media owners, media organizations and members of the civil society were among participants. Lighting the traditional oil lamp by the guests . The key note speech was delivered by Mr. Wajayananda Jayaweera, former director of development communication at UNESCO international programme. ‘Now it looks as if we have a window of opportunity to re-launch a discussion on media sector reforms.’ He said. To read his full speech click here. Mr. Paranawithana, Secretary to the Ministry of Media and Mass Communication lighting the oil lamp. Free media Movement and Sri Lanka Press Institute organized the event. This report has been prepared as part of the “Research Study on Media and Gender in Asia-Pacific” undertaken by the International Federation of Journalists, and supported by the UNESCO in partnership with UN Women. In line with UNESCO’s Communication and Information Programme for 2014 to 2017, the project comprises research on gender and media conducted in partnership with national stakeholders in seven countries of the Asia-Pacific region (South Asia, Southeast Asia and the Pacific): Cambodia, India, Malaysia, Nepal, Pakistan, Sri Lanka and Vanuatu. 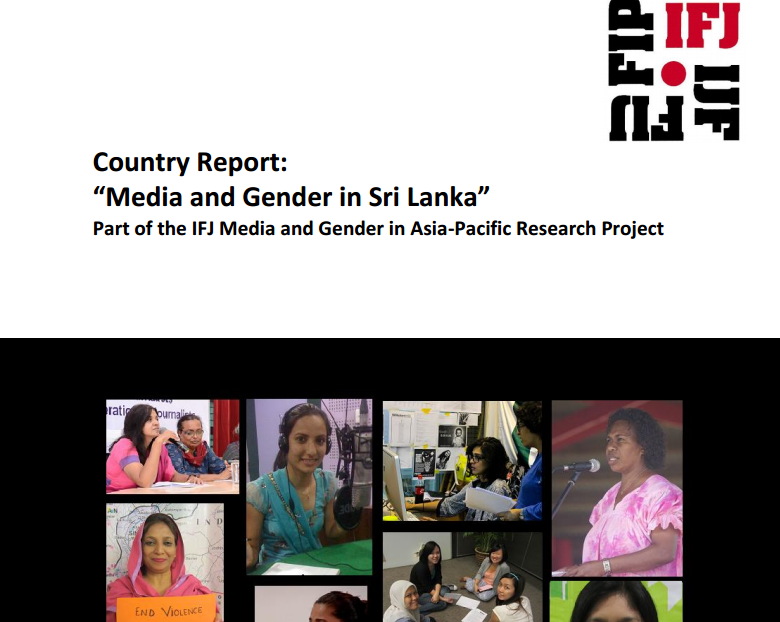 This report offers an overall analysis of gender inclusivity or its lack in the Sri Lankan media. The study is conducted within the framework of UNESCO’s Gender-Sensitive Indicators for the Media, specifically looking at areas covered under Category A(Gender balance at decision-making level, gender equality in work and working conditions, gender equality in unions, associations, clubs and organisations of journalists, other media professionals and media self-regulatory bodies, media organisations promoting ethical codes and policies in favour of gender equality in media content and gender balance in media education and training) and Category B (Gender portrayal in news and current affairs). The recommendations of the report also seek to influence systemic changes within the Sri Lankan media industry, both in policy and practice, through effective advocacy and training at different levels, to work towards inclusivity and equity in the island’s media. Free Media Movement condemns the attack by a government politician on the ‘Vidiye Wirodhaya’ event held in Hambantota Yesterday (21st December), where a group of civil society organizations under the banner ‘Viyaruwata Erehiwa, Jeewithaya Wenuwen’ (Against Rage, For Life) came together to build a common voice that demands democratic reforms against anti democratic activities of the current government. FMM also demands that the government takes tangible action to prevent any future attacks, threats and intimidation by mobs, under the leadership of government politicians, to suppress peaceful voices of citizens during this election period. This attack is a gross violation of freedom of expression of Sri Lankan citizens and a barrier for a free and fair election. The attack has allegedly been carried out by Hambanthota Mayor Eraj Fernando who rose to fame due to “toy pistol” controversy. Britto Fernando, Jayathilaka Bandara, Philip Dissanayake and Secratory of the Free Media Movement Sampath Samarakoon were among those that have been attacked and threatened by these seemingly government sponsored goons. Mr. Jayathilaka Bandara, Mr Prasanna Fernando and Mr. Sampath Samarsakonn were hospitalized due to injuries caused by the thugs. “While we were protesting in front of the main bus stand Hambantota Mayor Mr. Eraj Frenando came with a pistol and cut throat razors attacked us around 10.10 am. It was 10.25 when we called 911. Around 3.30 when we went to Hambantota police station to make a complaint they informed that they had not been informed about the incident by the emergency unit.” Mr. Sampath Samarakoon said. It is clear that various groups of government supporters constantly attack journalist and civil society activists who are in anyway seen to be critical of the government. We demand that the government, and especially the Sri Lanka Police Force, enforce law and order, and act against these government politicians who are trying to unlawfully obstruct public movements, and to ensure freedom of association and freedom expression of the people of Sri Lanka. We also urge the Election Commissioner to take necessary actions to ensure a free and fair election, and create an atmosphere free of violence and intimidation for a free and fair election that demonstrates a truthful public opinion. We request all people who value law and peace to join hands against these attacks. 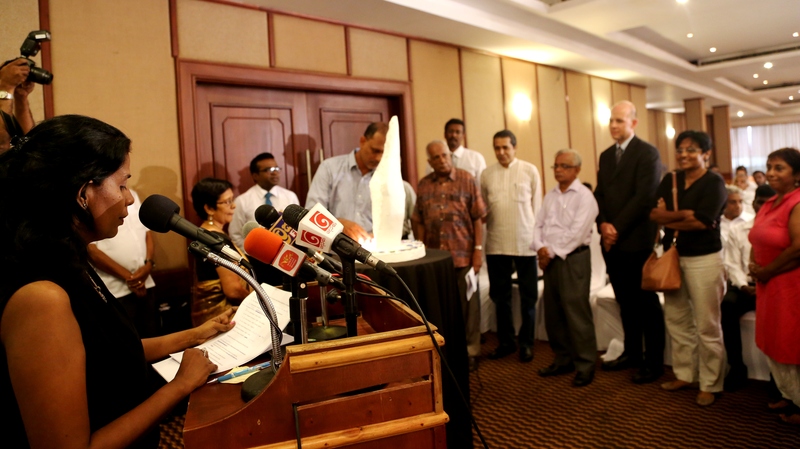 The Free Media Movement (FMM) of Sri Lanka yesterday ( 16th Dec 2014) handed over its short term proposals for re-establishing freedom of expression rights in Sri Lanka. 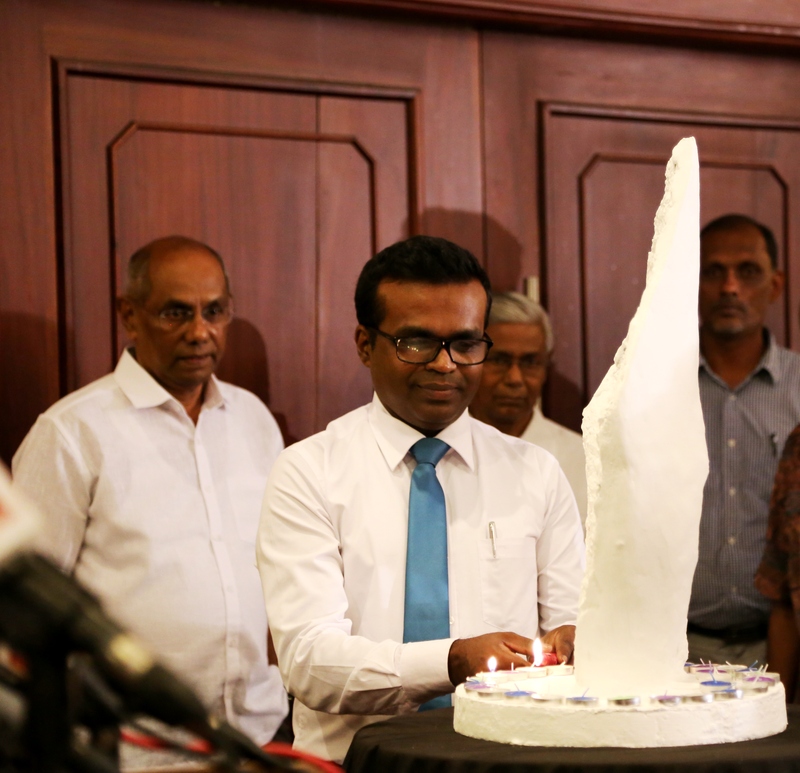 The document says that ‘Free Media Movement expects to bring forth long term proposals related to Freedom of expression rights Sri Lanka to be implemented by the proposed national Government after the Hundred-Day-Reforms under the new President. FMM hopes to formulate and submit such set of proposals in collaboration with other media and civil society organisations in Sri Lanka. Free Media Movement has already expressed its support to the common opposition candidate, Mr. Maithripala Sirisena, who will be contesting at the upcoming presidential election with a mandate to abolish executive presidency, reinstate the 17th Amendment, establish an electoral system more suitable and provide concessions to economic difficulties being experienced by people; these measures are included in the First Hundred Days Programme of the Common opposition. 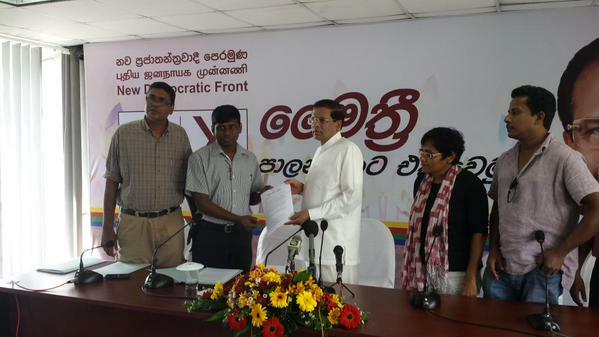 The Free Media Movement is also a signatory to the Memorandum of Understanding signed with common presidential candidate, Mr. Maithripala Sirisena. 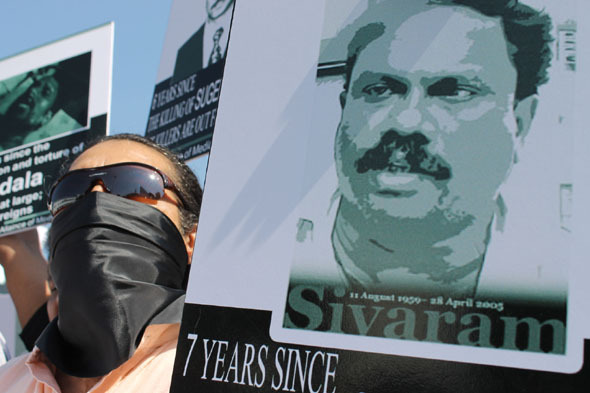 Over the past several years freedom of expression rights in Sri Lanka has been on a steady decline. The Free Media Movement has repeatedly requested the present Government led by President Mahinda Rajapakse to protect freedom of expression rights of all Sri Lankans which is based on people’s right to information. However, since our requests have been completely neglected by the Government headed by the President, Free Media Movement does not think that another plea to Mr. Rajapakse, who is contesting for the third term, will bring any result. Therefore, Free Media Movement submits following short term proposals to the common opposition and its presidential candidate Mr. Maithripala Sirisena to be implemented within the first hundred days of winning the presidential election in order to ensure media freedom in the country to some extent. Enforce the Freedom of Information Act approved by the Cabinet of Ministers under Prime Minister Ranil Wickremasinghe in February 2004 as an initial and symbolic gesture to express the respect for people’s inviolable right to freedom of information which is recognised by the United Nations Declaration of Human Rights and the Constitution of Sri Lanka. In this regard, Free Media Movement further requests the interim government of common opposition to work in collaboration with Sri Lanka Press Institute, which represents journalists’ associations, Newspaper editors and media proprietors and relevant civil society organisations. This step will be a due recognition of the various campaigns carried out by the media community and civil society groups in defense of people’s right to information. Human Rights Commission of Sri Lanka (HRC‐SL) which should be transformed to an independent institution after reinstating 17thAmendment should immediately initiate investigations in to killings of and attacks on journalists and media institutions during the last ten years; for this purpose a special division of Human Rights Commission should be established with necessary infrastructure and financial allocations. The HRC‐ SL should be allowed access to information already collected regarding such incidents by the state intelligence services. People’s right to information could only be realized through the existence of a media culture which is ethical, truthful, fair and diverse. In this regard, as a symbolic and initial step, state controlled print and electronic media should be de‐politicised and should be transformed in to public service media.It should be ensured that the state controlled media precisely follows the recommendations and guide lines of the Commissioner of Elections at the general elections to be held following constitutional reforms. It is a known fact that over the past years Sri Lankan media drowned in a formidable self‐censorship. 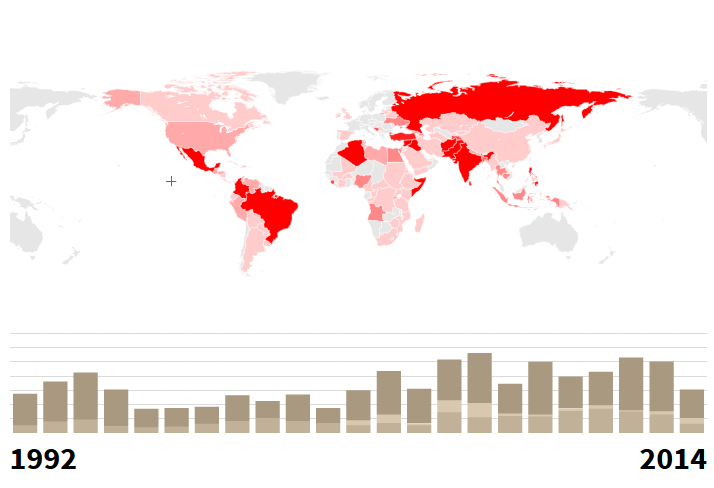 At present investigative and truthful reporting has become an invitation to death‐threats. As a symbolic and immediate step towards changing this situation, all websites officially and unofficially censored by the present Government should be lifted. Free Media Movement acknowledges that media freedom should be accompanied by the social responsibility. In general, social responsibility is expressed through journalism ethics. Free Media Movement considers defaming individuals based on untrue facts and unsubstantiated reporting to be a cancer that decays media freedom from within. To pave way for justice for persons and institutions so prejudiced, Free Media Movement requests all news media including the websites to voluntarily join the Press Complaints Commission of Sri Lanka (PCC SL) which functions on the code of professional ethics formulated under the direction of Editors Guild of Sri Lanka with the participation of Free Media Movement. In case of unwillingness to associate with the PCCSL FMM requests those news media to establish their own self‐regulatory mechanisms. 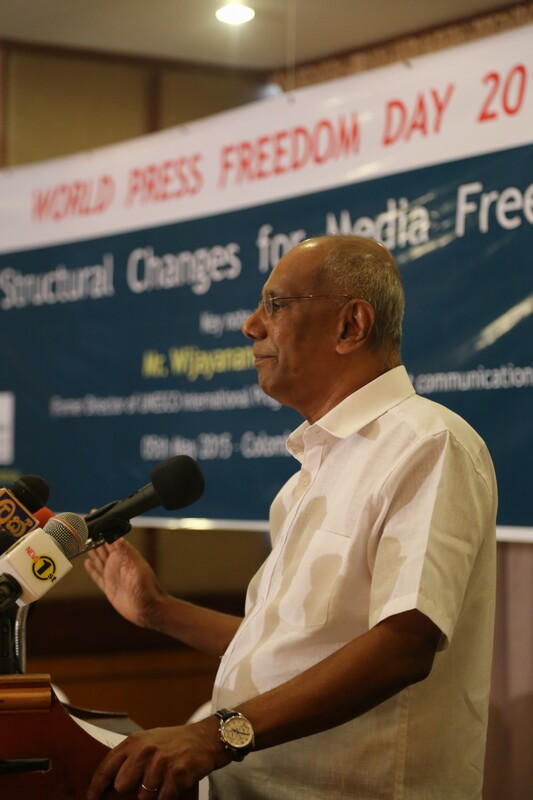 Free Media Movement expects to bring forth long term proposals related to Freedom of expression rights Sri Lanka to be implemented by the proposed national Government after the Hundred‐Day‐Reforms under the new President. FMM hopes to formulate and submit such set of proposals in collaboration with other media and civil society organisations in Sri Lanka. A group of thugs led by Government politicians has attacked the campaign of the ‘Viyaruwata Erihiwa ; Jeewithya Wenuwen – ‘වියරැවට එරෙහිව, ජීවිතය වෙනුවෙන් ( Against the Craze for the Life) at Eppawala in Anuradhapuraya district few hours ago, yesterday ( 05 Dec 2014), according to a press release issued by Sampath Samarakoon on behalf of the Co-ordination committee. Chairman of the Eppawala local Government body, the Pradesheeya Sabha, Wasantha Bandara and member of the Sabha Uthitha Kumara has led the gang of thugs that attacked the campaign. Hiru TV journalist Mr.Thisara Saman who was covering the incident was also assaulted and his camera was damaged by the gang. The gang has arrived as the campaign was coming to an end and assaulted some of the participants including the well-known peace singer Jatathilaka Bandara. The gang has later fled as large number of people gathered against the gang. Thugs attacked us stating not to criticizes their King. Mr. Jayahilaka Bandara said. “For all these years I fought for peace I was never attacked. This was the first time. Despite all these obstacles we will continue to fight. Even if they kill me this fight will not stop.” he further stated. FMM press statement about this incident will be published on Monday 8th December. ‘Viyaruwata Erihiwa ; Jeewithya Wenuwen – ‘වියරුවට එරෙහිව, ජීවිතය වෙනුවෙන් campaign is traveling around the country exposing the present regime’s anti-democratic practices and consists of large number of civil groups. මාධ්‍ය මර්ධනයට එරෙහිවත්, අවනීතියට එරෙහිවත් ‛කළු ජනවාරි’ විරෝධය ඊයේ(29) ලිප්ටන් වටරවුමේදී විශාල පිරිසකගේ සහභාගීත්වයෙන් පැවැත් වීය. දේශපාලන පක්ෂ නායකයින්, වෘත්තීය සමිති, ශිෂ්‍ය ව්‍යාපාර, නීතිඥ සංවිධාන මෙන්ම බහුජන සංවිධානවල සමාජිකයින් සහභාගී වූ මෙම විරෝධය ජනමාධ්‍ය සංවිධාන සංවිධාන කරනු ලැබූවේ, විශේෂයෙන් පසුගිය කාලය තුළ ශ්‍රී ලංකාවේ ජනමාධ්‍යට එරෙහිව එල්ල වූ මර්දනයට එරෙහිවත් විශේෂයෙන්ම ඝාතනයන්ට, ප්‍රහාරයන්ට හා අතුරුදහන් කිරීම් වලට ලක් වූ මාධ්‍යවේදීන් හා මාධ්‍ය සේවකයින්ට අදාළව නීතිය ක්‍රියාත්මක කර වගකිව යුත්තන්ට දඬුවම් ලබා දීමට ආණ්ඩුව ක්‍රියා නොකිරීම පිළිබදව විරෝධය පළ කිරීම සඳහා ය. එහිදී පසුගිය කාලය තුළදී ජනවාරි මාසය තුළ සිදු කළ ලසන්ත වික්‍රමතුංග ඝාතනය, සිරස මාධ්‍ය ආයතනයට එල්ල වූ ප්‍රහාරය මෙන්ම මාධ්‍යවේදී ප්‍රගීත් එක්ණැලිගොඩ අතුරුදහන් කිරීම වැනි බරපතල සිදුවීම් ද, ඝාතනය කළ මාධ්‍යවේදී සිවරාම්, නිමලරාජන්, සුගීධරන් මෙන්ම බරපතල ප්‍රහාරයන් ලක්වූ පෝද්දල, කූගනාදන් වැනි මාධ්‍යවේදීන්ට ද තවමත් යුක්තිය ඉෂඨ නොවීම සලකා අදාල විරෝධතාවය ‛කළු ජනවාරිය’ ලෙස නම් කිරීමට තීරණය කරනු ලැබූ බව විරෝධතාවය සංවිධානය කළ මාධ්‍ය සංවිධාන එකතුව ප්‍රකාශ කළේ ය.කෙසේ නමුත් පසුගිය කාලය පුරාම විශේෂයෙන් ජනවාරි මස තුළදී පමණක් ජනමාධ්‍යට එල්ලකල ප්‍රහාරයන් අති විශාලය. එමෙන්ම බිහිසුනුය. නමුත් ඒ කිසිදු සිදුවීමකට වගකිව යුත්තන් නීතිය ඉදිරියට පැමිණ වීමට පිළිගත හැකි පරීක්ෂණයක්වත් සිදු කිරීමට රාජපක්ෂ ආණ්ඩුව මෙන්ම ඊට පෙර පැවති කිසිදු ආණ්ඩුවක් සමත් වී නැත. එබැවින් කළු ජූලිය මෙන් කළු ජනවාරියද ලංකාවේ ප්‍රජාතන්ත්‍රවදාය මෙන්ම මානව හිමිකම්වල තරම මැනවින් කියාපාන මාසයන්ය. ලංකාවේ ආණ්ඩුකරණය පිළිබදව මෙන්ම ලංකාවේ ජනමාධ්‍ය නිදහසේ තරම මැනවින් කියාපාන මාසයන් ය. එබැවින් පාලකයන්ගේ ආශීර්වාදය මැද, පොලීසිය බලා සිටිය දී ම්ලේච්ඡ ලෙස මිනිසුන් මරා දැමූ ‛කළු ජූලිය’ මෙන් ‛කළු ජනවාරිය ද කළුම කළුය. මෙම විරෝධතාවය ලිප්ටන් වටරවුමේ දී සිය විරෝධතාවයෙන් පසුව එතැන් සිට මහජන පුස්තකාලය දක්වා පෙළපාලියකින් පැම්ණ සම්මන්ත්‍රණයක් පැවත් වූ අතර මාධ්‍ය සංවිධාන නියෝජිතයින් මෙන්ම විවිධ සංවිධාන වල නියෝජිතයන් එම සම්මන්ත්‍රණය අමතනු ලැබීය. සිලොන් ටුඩේ පුවත් පතේ ප්‍රධාන කර්තෘවරයා ලෙස හා කර්තෘ මණ්ඩල අධ්‍යක්‍ෂ ලෙස ද කටයුතු කළ ලලිත් අලහකෝන් මහතා සහ කාටූන් ශිල්පි වසන්ත සිරිවර්ධන මහතා සේවයෙන් ඉවත් කිරිමට සිලොන් ටුඩේ පේපර්ස් ආයතනයේ කළමණාකාරීත්වය ගෙන ඇති තීරණය පිළිබඳව නිදහස් මාධ්‍ය ව්‍යාපාරයේ දැඩි අවධානය යොමුවී ඇත. අදාළ සිදුවීම පිළිබඳව ලලිත් අලහකෝන් මහතා අප වෙතද යොමු කර ඇති නිවේදනයට අනුව ඔහුගේ සේවය අවසන් කර ඇත්තේ වාචික දැනුම් දීමකින් පමණක් වන අතර මේ දක්වාම ඔහුට චෝදනා පත්‍රයක් හෝ සේවයෙන් ඉවත් කළ බවට ලිඛිතව කිසිඳු දැනුම් දීමක් කර ඇති බව නොපෙනේ. එමෙන්ම කාටුන් ශිල්පි වසන්ත සිරිවර්ධන මහතාගේ සේවය අවසන් කර ඇති ආකාරය ද යුක්ති සහගත කිරීමට ද සිලොන් නිවුස් පේපර්ස් ආයතනය කටයුතු කර නොමැත. 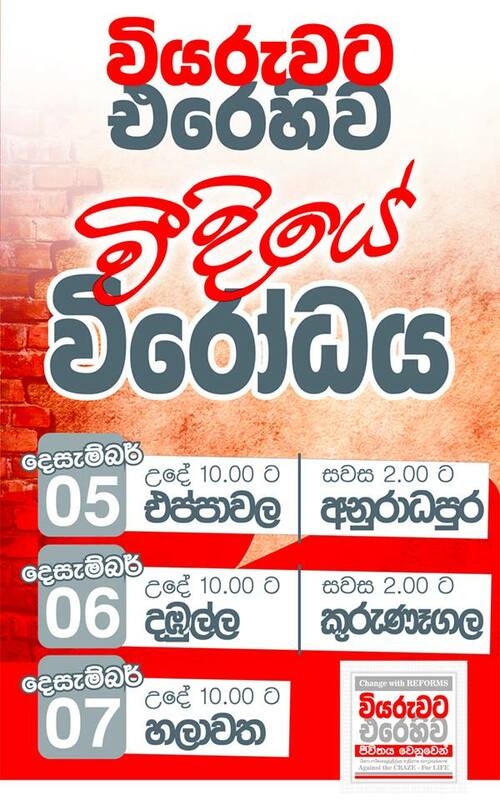 ශ්‍රී ලංකාවේ මාධ්‍ය නිදහස වෙනුවෙන් පෙනී සිටින හා මාධ්‍ය කර්මාන්තයේ අභිවෘද්ධිය මෙන්ම එහි විවිධත්වය වෙනුවෙන් පෙනී සිටින සංවිධානයක් ලෙස ඒ පිළිබඳව අප තුළ ඇත්තේ දැඩි කනස්සල්ලකි. ශ්‍රී ලංකාවේ මාධ්‍ය ආයතනයන් ආණ්ඩුවේ දැඩි ග්‍රහණයට නතු වෙමින් හා නිදහස් මාධ්‍ය ක්‍රියාකාරීත්වය දැඩි මර්ධනයකට ලක්ව ඇති මෙවන් මොහොතක මේ ආකාරයේ සිදුවීම් ඇතිවීම ශ්‍රී ලංකාවේ මාධ්‍ය ක්‍රියාකාරීත්වයට කිසිසේත්ම යහපත් තත්ත්වයක් නොවේ. එබැවින් අප මේ මොහොතේ විශේෂයෙන්ම ශ්‍රී ලංකා පුවත්පත් ප්‍රකාශකයන්ගේ සංගමයෙන් හා කර්තෘ සංසදය ප්‍රමුඛ අනෙකුත් මාධ්‍ය සංවිධානයන්ගෙන් ද ඉල්ලා සිටින්නේ කර්තෘ මණ්ඩල නිදහස හා මාධ්‍ය හිමිකරුවන්ගේ අයිතීන් පිළිබඳව සිදු කරන සංවාදයක් තුළ සියළු පාර්ශවයන්ට එකඟවිය හැකි පොදු ප්‍රතිපත්තියකට පැමිණීමට කටයුතු කළ යුතුව ඇති බවය. President Mahinda Rajapaksa has claimed that eight websites, run by one person, are bringing evil to the country. He made the comment during a speech to expatriate Sri Lankans in Thailand during a meeting in Bangkok on May 29. The president said the 30-year-old war has ended and all communities are now able to live in unity and peace. The country is maintaining an 8.3 per cent economic growth, while there is a 22 pc increase in development in the north, an indication the amount of work done for the province, he said. However, there is a society which is distorting our journey, charged the president. He added that these eight websites, run by one person under one institution, is slinging mud and campaigning in order to paint a wrong picture about the country. ශ්‍රී ලංකාව තුල හා ඉන් පිටත සිට ප්‍රවෘත්ති පළකරන වෙබ් අඩවිවලට ලංකාව තුලදී පිවිසීමට තිබූ හැකියාව අවහිරකරමින් ඒවාට පහසුවෙන් පිවසීමට තිබූ අවකාශය වලකාලමින් එම වෙබ් අවඩි සහමුලින්ම වාරණය කිරීමට විරැද්ධව නිදහස් මාධ්‍ය ව්‍යාපාරය විසින් ගොනු කරනු ලැබූ මූලික අයිතිවාසිකම් පෙත්සම කිසිදු හේතු දැක්වීමකින් තොරව ඊයේ ප්‍රතික්ෂේප කළේය. කෙසේ නමුත් මෙවැනි ප්‍රතික්ෂේප කිරීමකදී එයට හේතු දැක්විය යුතුවිය නමුත් මෙහිදී කිසිදු හේතු දැක්වීමක් සිදු නොකර මෙය ප්‍රතික්ෂේප කිරීම තුල කිසියම් පුද්ගලයෙක් හෝ ආයතනයක් අධිකරණයක් තුළ ගොනු කරන ලදි මූලික අයිතිවාසිකම් පිලිබදව පෙත්සම් මගින් යුක්තිය ඉෂ්ඪ කර ගැනීම පිළිබදව තත්ත්වය මනාව පිළිබිබු වේ. විශේෂයෙන් මෙම මූලික අයිතිවාසිකම් පෙත්සම නිදහස් මාධ්‍ය ව්‍යාපාරය වෙනුවෙන් සුනිල් ජයසේකර සහ උදය කලුපතිරණ යන අය විසින් ගොනු කරන ලද්දේ පසුගිය වසරේදී වෙබ් අඩවි 5ක් විදුලි සංදේශන නියාමන කොමිසම විසින් ලංකාව තුල එයට පිවිසීම වාරණය කිරීම නිසා ජනතාවගේ තොරතුරැ දැනගැනීමේ මූලික අයිතිය එයින් උල්ලංඝනය වන බව පවසමින් ය. ආචාර්ය ශිරාණි බණ්ඩාරනායක, එන්. ගාමිණි අමරතුංග සහ ආර්.කේ. සුරේෂ්චන්ද්‍ර යන විනිසුරු මඩුල්ල ඉදිරියේ පෙත්සම් කරැවන් වෙනුවෙන් පෙනී සිටි නීතිඥ ජේ.සි. වැලිඅමුණ මහතා කියා සිටියේ වෙබ් අඩවි තහනම් කිරිමට මේ දක්වා නීතියෙන් ප්‍රතිපාදන නොමැති බවයි. වගඋත්තරකරුවන් වෙනුවෙන් පෙනී සිටි නීතිඥයින් කියා සිටියේ අදාළ වෙබ් අඩවි ප්‍රවෘත්ති හා ජනමාධ්‍ය අමාත්‍යාංශයේ සහ විදුලි සංදේශ නියාමන කොමිසමේ ලියාපදිංචි කර නොමැති බවයි. කෙසේ නමුත් පශ්චාත් යුධ ශ්‍රී ලංකාව තුළ නව මාධ්‍ය භාවිත කරමින් නව සංවාදයක් ඇති වෙමින් තිබියදී මෙන්ම එය බොහෝ විට ප්‍රධාන ධාරාව අමාන්ත්‍රණය නොකරන ඉසව් මෙම මාධ්‍ය තුලින් ආමත්‍රණ්ත්‍රය කරමින් තිබියදී මෙවැනි වාරණයන් පැනවීම තුලින් ලංකාව තුළ තිබෙන මාධ්‍ය ඒකාධිපතිත්වය නැවත වරක් මනාවට පිළිබිබු වේ. ඒසේම මෙවැනි අවහිර කිරීම් හෝ අඩපණ කිරීම ලෝකයේ ප්‍රජාතන්ත්‍රවාදය ගරැ කරන ශ්ෂ්ඪ සම්පන්න කිසිදු රටක් ක්‍රියාකර නොමැති අතර ඒ සදහා ඉතාමත් අසාර්ථක උත්සහයන් පවා ගෙන ඇත්තේ ප්‍රජාතන්ත්‍රවාදය, මූලික අයිතිවාසිකම්, තොරතුරැ දැනගැනීමේ නිදහස සහ පුරවැසියන්ගේ නිදහස පිළිබදව කිසිදු තැකීමක් නොකරන චීනය, මියන්මාරය වැනි රටවල් අතලොස්සක් පමණි. එබැවින් මෙයින් ලංකාව නැවතත් ප්‍රදර්ශණය කර ඇත්තේ අදහස් පළකිරීමේ හා තොරතුරැ දැනගැනීමට පුරවැසියා සතු අයිතිය පිළිගැනීමට සහ භාවිතයට ඔවුන් තුළ අති අකමැත්ත සහ ඒ තුළින් ජනමාධ්‍ය මර්ධනය කිරීමට ඔවුන් තුළ ඇති දැඩි අභිලාෂයයි.